THANK YOU for voting us #1 for @sfreporter’s 2018 Best of Santa Fe! Thank you, thank you, THANK YOU! We are so incredibly honored to have won the @sfreporter category for "Best Instagram Feed" 2016! We can't begin to describe how much this means to us or how totally thankful we are for the community who got us here. We're speechless (and if you know us, that's saying A LOT!) #SimplySantaFe exists because of the incredible photographers who love Santa Fe as much as we do and who so generously show that love on Instagram. We happily share this honor with all of YOU! It's a win for us all. To celebrate, we'll be doing a takeover of the @sfraroundtown #Instagram account for the #BOSF2016 Block Party THIS Friday, 7/29. Food, drinks, giveaways, photo booth, vendor booths, #InstaSquare and the @thejayhawksofficial! Join us! 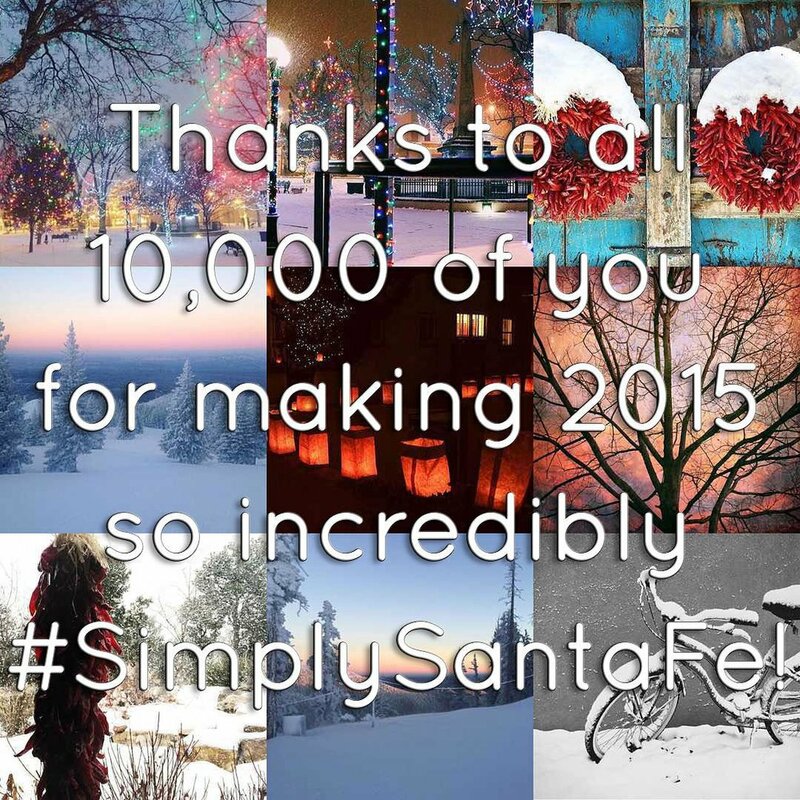 Thanks to all 10,000 of You for making 2015 so #SimplySantaFe! Watching our follower count this morning was like watching the ball drop for New Years! 9997, 9998, 9999, 10k!!!! We are unbelievably thankful to have the support of this talented #SimplySantaFe Instagram community and with the 30k photos you all have shared with us this past year. @sherylcancellieri @therealangeloromero@montana.walcott @sofiamileti@anibanim @taosdawn @dumbledoresgirl@percystith & @saroxox. Thank you all for helping us reach this amazing milestone today and we can't wait to see the imagery you create in 2016! One year ago today we did our first #SimplySantaFe post. 8.8K followers, 775 posts, 95.8K likes, 29K images, 9 Instameets, 1 photo essay, 3 news articles, 10 social media/press events, 5 photo contests, 3 radio spots, 1 photo exhibition, 2nd place for the "Best of Santa Fe" Instagram feed, and 1 TV appearance later we are going strong! 💪🏼 We feel proud about how far we have come in 12 months and owe so much of that to all of YOU! We so appreciate your support, encouragement, and enthusiasm for Santa Fe and Instagram! Thank you for submitting amazing images, coming to our events, and allowing us to turn our passion into this project. We've never missed a day of posting, have featured a wide variety of images and photographers, and hopefully cultivated an awareness about the power of Instagram. We've done our best to help build community, collaborate with fantastic partners, promote all things local, and basically have so much FUN! And here's the kicker...we're just getting started, so stick around for another year of awesomeness! We are so excited to be included among the "Best Local Instagram Feeds" in the @sfreporter's Best of Santa Fe 2015! We are so honored to have taken the second place spot in our few months of running this #SimplySantaFe account! A huge CONGRATULATIONS to @howtosantafe & @santafebrew as well as all of the local business and organizations featured this year. We want to thank all of our followers for voting and we can't wait to celebrate with you all at the Best of Santa Fe Block Party this Saturday August 1st at the Santa Fe Railyard from 5pm-midnight!